Saturday October 21st, 2017 - Happy Anniversary Centennial Museum! The Centennial Museum celebrates their 50th anniversary with a fish fry and some musical entertainment. Congratulations to the curator, Nicole, on organizing a great event. It was so popular that it was sold out at 160 people! The dinner provided by the Legion was great, the slide show was educational, and then there was the musical entertainment! 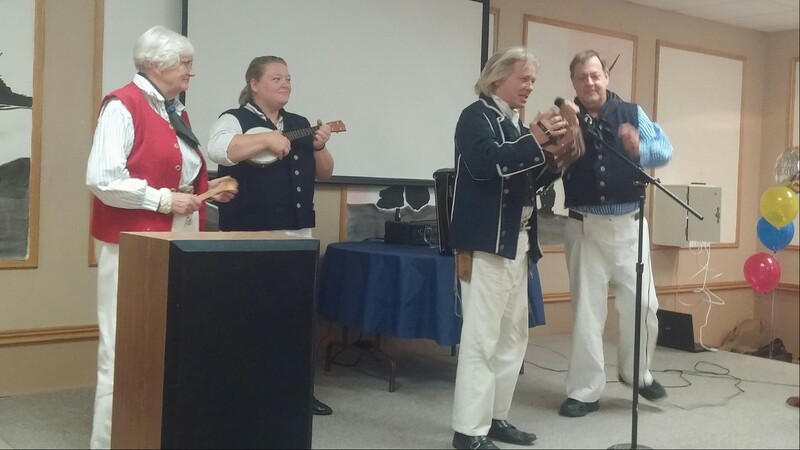 Music was preformed by Homemade Jam, Nonie Thompson, and The Ships Company of Penetang! 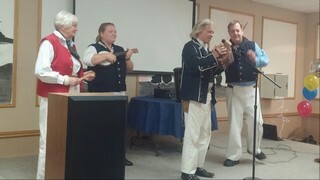 Some of our more musical members were up in stage performing some sea shanties. On accordion, Bill, on concertina, Mark, on bangolele, Cait, and filling out the percussion section, Birdie on the spoons. There were also members attending the event as guests. The Ships Company owes much of what we have become to our partnership with the Centennial Museum and Archives. Congratulations on 50 years and here's to 50 more. Hip, hip, HUZZA!